I’ve spent a few hours a day over the last few days filing and cleaning out old files. I’ve come up with a stack for shredding that’s over 20cm thick. I’ve also recycled a stack about one-third that size. Part of that was a stack of stuff from my former employer that’s probably at least 12cm thick. I found copies of cover letters and resumés dating back to 1997. And vaccination records dating back to 1974. And my skydiving logbook from 1996. 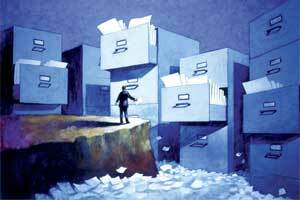 My overall plan is to go paperless, which is not as easy as you might imagine. I’m trying to update all my bills to e-bills and file my taxes online; my bank statements are already all online. But once everything’s cleaned out and current, my plan is to stay on top of the filing — have a place for everything and everything in its place. As well, I’m using Remember the Milk and Google Calendar to keep track of tasks and appointments, and Gmail for all my contacts, all of which sync to my phone. Paperless, eh? But what if your hard drive crashes? I’m trying to sort out regular backups and use Dropbox to sync folders and backup to the cloud. Any other suggestions or critiques? This entry was posted in Opinion and tagged backup, Dropbox, minimalism, paper, productivity.